Only one person showed up for Titans of Industry at 10am, so it didn't run. He's a friend of a friend, though, so he asked to play it next weekend at a game day that's been scheduled. So I'm happy to get another test in next week. I jumped into another game of St. Petersburg. This time, there was one new player. He had played before, but we gave him a rules refresher. However, one of the experienced players then proceeded to micromanage every single one of the new(ish) player's turns for the rest of the game. I don't mind giving a little help in the first round or two, but this went on until literally the very last turn of the game. When it was the new(ish) player's turn, the experienced player talked through multiple options the new(ish) player, laid out the strategic implications of each choice, then told the new player outright which was best ("I would do this in your situation"). Municipality's second session was scheduled for two o'clock. Only one person showed up for that, so he went to another game instead. That's the third time this convention I've had a single person show up. Oh, well. Paul Girardi of Z-Man was meandering about and we struck up a conversation. We discussed the recent Z-man acquisition, and how it relates to the economics of running a small-to-midsize publishing company. We also talked about the costs involved in the business of publishing and he gave advice on how to go about doing my small print run of Pioneer. Chris Adams joined us and the topic moved to the business of appealing to females in designing games. We talked about the Bechdel test and what the equivalent be for games. I pointed out that many games are third-person omniscient, so the player doesn't have an avatar much less a gendered one. We talked about how to design a game to appeal to female gamers without resorting to cheap gender stereotypes. Decipher's Boy Crazy is the ne plus ultra of offensively stereotyping female gamers. How does a designer try to grow the hobby as a whole with a relatively unrepresented demographic while avoiding even more subtle forms of stereotyping? Is it even a designer's job to worry about doing this in the first place? Paul taught us and we started a game of Alien Frontiers. The game is clever, but it is also something I will not enjoy, as I am deathly allergic to dice and this game could be named Agricola: The Dice Game. Still, I can respect the clever parts of it. People who don't share my aversion to pipped polyhedrons should check it out. We decided to cut it short as I had previously signed up for Small World Underground. This was my first play of the new expansialone, and it will likely be my last. I feel the new rules just complicate the game without increasing the fun. Having those little tokens across the board are just one more thing to remember every turn, dragging the game out by at least 10 minutes. I understand the desire to add strategic concerns with the places and relics driving players together, but Small World isn't a game I turn to for deep strategy. It's supposed to be light fun. Underground got rid of the light and, as a result, got rid of the fun. I then joined my friends in a game of one of my favorites, Le Havre. This is a game I am just terrible at, but love nonetheless. I really would like to play it enough to become decently skilled at it, but if I can get five people together for a long game, I'm likely to want it to be a playtest instead. I managed to ship for 60 francs in the final round. When we tallied the scored, I stood at 184, Anni around 150, Andy at 130-something, and Doug at 183. I was both happy to win a game of Le Havre, which I haven't done since my introductory play, and shocked, as I didn't think I stood a chance against Doug's wall of buildings. Everyone else was shocked too, so we reviewed my scoring. When I shipped, I had gotten 12 francs for three Leather, 8 francs for a Steel, and 40 francs for four Coke. 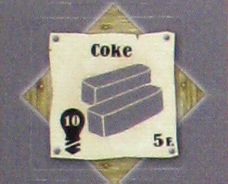 My friends pointed out that Coke isn't worth 10 francs, only 5. I had looked at the energy output of Coke (10) when shipping instead of its monetary value (5). My score dropped to 164 and instead of winning by one I lost by 19. Note to self: next time you think you've won a game, make sure you haven't (accidentally) cheated before getting excited. So, is there a term for three men talking to each other about the Bechdel test? Really, I don't think that Bechdel makes much sense for non-narrative art forms--you could use it for opera, but not for classical music--and most (board) games fall in that category. (Maybe non-narrative isn't exactly the word I want, but certainly they're not based on interactions between characters.) I suppose you could apply it to something like Tales of the Arabian Nights, but for most board games there aren't really characters per se. What you could do, though, is look at the underlying point of the Bechdel test, which is to pay attention to whose experiences are being centered. If you come at it from a perspective of theme, most Euros (and wargames, I suppose) with historical themes don't do much to undermine the theory that history is a list of Things That High Status European Men Did... and many of them are colonialist as all get out, to boot. That's actually one of the things that's cool about the theme of Agricola; it's about a peasant family trying to survive and raise their children (that and farming involve things that grow, which is usually very satisfying in a game) instead of some powerful lords trying to gain territory or impress their peers. 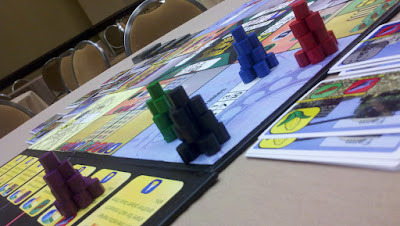 In any case, as to game design and women, a woman just won the Spiel des Jahres... with an abstract. I don't know what that means, but it is a fact. Good point about the SdJ. Are you saying that avoiding designs centered around activities of Powerful Men of Yesteryear is the best way to appeal to female gamers? It is a bit odd for a group of men to discuss this amongst themselves, so I am interested in your perspective. As for Alien Frontiers, though, I think the similarity with Agricola is greater than you think. It's not just worker pacement where you can grow your family. The cards you can get give you more actions /abilities as the game goes on. Colonizing in AF is much like Occupations in Agricola, as it makes certain actions better. I can't speak to time pressure, as I didn't play a complete game. As for the flavor of building up a farm, you're right that AF lacks that; I guess I don't really see games in terms of theme. I do want to say, though, that my recommendation had nothing to do with Agricola; it was purely on the basis of the cleverness in how it uses dice. Pro/Bro tip: Don't play le havre with 5. 3 is the good stuff. 1) already include other women. It can be fairly uncomfortable to be the only woman in a group. As for game design, well, women aren't a monolith and there's not going to be some kind of magic solution there. Opening up the kinds of themes that exist is never bad, and refraining from creating games that are insulting or hostile is obvious. You've got exhibit A in your post.. Exhibit B is Emira (why yes, that is an auction game where the lots are women that you can marry. Greeaaat. No, I am not pacified by one of the designers being female.) Exhibit C is this one (I'm so disappointed, Uwe.) But again, it should be obvious to any sentient being that these themes are bad ideas. Other than that... I'm not so sure you're going to find that there's a huge gender split in theme appeal, at least, outside of wargames. Part I... Blogger can't accept my whole comment, apparently. Dammit, why does Blogger hate me? Can't post. Alien Frontiers: The cards do not, in general, give you more possible options for actions that you can take. You have the same number of options available (what is it, eight or nine? Can't recall) near the end of the game that you do near the beginning. The cards mainly just vary your abilities with them. And colonizing is a way of obtaining victory points instead of a moment where you take time out in the hopes that you can accomplish things more efficiently in the future--you'd get them even if they didn't give you abilities. Plus there aren't very many of them, so you don't get the same combo effect. This sounds like nitpicking, but look at it this way: In Agricola, you have the reading phase. You take your hand of cards, look over it, try to prioritize and pick the best actions--you are making strategic decisions about how you think the game will play out. Then, you get to see whether any of this actually happens and how you will adjust your game as it goes along. And you're doing all this without having made these specific decisions before, because there are so many cards that you're unlikely to be dealt the same hand twice. In Alien Frontiers, you're quite likely to have some idea what you think the best territory is, but after that it will probably become rather tactical as you are competing for these powers and trying to take the best one that is left or protect what you have. As for the cards, you'll take them as they come up, if you want to. But you don't know what will be there ahead of time. Which is not to say that one is bad and the other is good, but if they are fun, it is for very different reasons. Part II obliterated Part I. Trying AGAIN.